Carl Paoli is a movement expert, specializing in strength and conditioning for Crossfit, gymnastics and action sports. Back in summer we caught up with him for a quick interview and seminar on human movement and life performance in general. We also filmed five different Rope Climbs tutorials, which are gathered in the following article. Carl recently published his new book where he presents the art of movement and give us a personalized program that shows how to connect four basic movement styles to fit specific purposes. Find out more (click here). 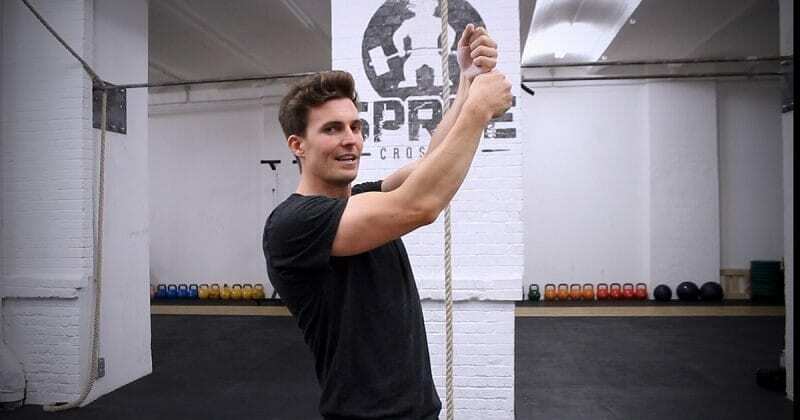 It’s all about strength and how you hold on to the rope: strict legless rope climb is the most challenging style, but the ultimate goal we want to achieve. The leg position (legs hanging down, L-position, tuck position..) doesn’t matter as much as the strength to take small steps and pulls with your arms. Short, fast and kicking style of the kip: instead of doing the long swing, focus on the shorter and faster kip, similar to the one you use while performing kipping dips: knees drive up – explosive kip. Use the basic kip, called swing which is the same kip you would use for bar pull-ups. The only difference is with the shoulder engagement: when doing pull-ups we hang. While when kipping on a rope, shoulders need to stay engaged. The faster version of regular rope climbing is known as the Russian Wrap. It works similar to Spanish Wrap, but the feet position is a bit different. The most basic and the safest form of rope climbing, especially appropriate for beginners, is a style called Spanish wrap.